To wit, to woo, sweet dreams to yooo! 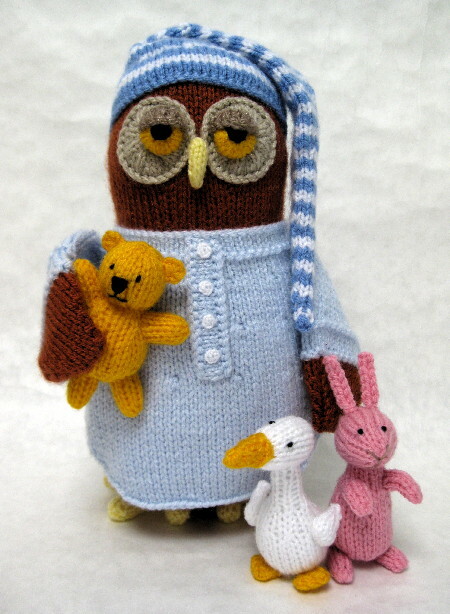 Measurements Owl: 10in (25.5cm) tall; Teddy: 3in (7.5cm) tall; Goosie: 3½in (9cm) tall; Bunny: 4in (10cm) tall. You will need Of Hayfield Bonus Toytime DK 25g balls: 14g in White 961, 12g in Sunflower 978, 10g in Bluebell 969, 6g in Pink 992, and 2g in Stone 889; of Hayfield Bonus DK 100g balls: 40g in Copper 843, 10g in Primrose 957, and 1g in Walnut 927; of Hayfield Baby Bonus DK 100g balls: 40g in Baby Blue 854; oddment of black DK yarn; pair of 3mm (no.11) knitting needles; 85g of washable toy stuffing; long tweezers.